French pianist Alexandre Tharaud takes on the blockbuster 'Rach 2' concerto in a thrilling performance with the Royal Liverpool Philharmonic Orchestra and Russian maestro Alexander Vedernikov. It is coupled with more intimate Rachmaninov for piano six-hands (for which Alexandre is flanked by Alexander Melnikov and Aleksandar Madžar) and the icing on the cake: a sublime Vocalise in the original version for voice and piano, with pure-voiced French soprano Sabine Devieilhe. 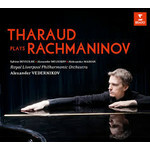 Alexandre Tharaud's recorded catalogue is large and eclectic, but this is the first time he has devoted an entire album to Russian repertoire - specifically to the music of Sergei Rachmaninov. "I was still quite young when I first played this concerto," explains Tharaud. "I adored it … Rachmaninov's virtuosity really appeals to young pianists. Today, of course I'm still enthralled by the concerto's virtuosity, but now I'm more interested in its dark shadows: the sense of despair, of staring into the abyss. My interpretation of Rachmaninov has changed a lot over the years."